The magical time betwixt daylight and nightfall. This is the hour in which shadows come alive as many people go to rest from the days travails. This is the time of blending when anything is possible. It is also my term for the time of year when we are between sets and the old sets are not quite done cycling out. M13 has had time to sink into our subconscious but perhaps not quite to the depths we'd like (or dislike if you abhor dreaming about m:tg.) And so with some of this in mind I began brewing decks that I know will be obsolete in a matter of weeks. Why? Because sometimes when a set is about to rotate is when all kinds of crazy things come together. Particularly, this is now mainly true only of the Standard format because Modern is eternal (along with Legacy) and Extended (the perhaps most loathed format of all time) is irrelevant. "Looking forward to opening Return To Ravnica Packs, eh?" Some people seem to have this idea about Standard format that they must play the top tier decks or not at all. After all if there are top decks in a format it must be solved. And in some ways I agree with this philosophy. If you feel that you must have a better than average chance to win then in any given format you are going to want the top deck you can muster. Anything less is a concession to the laws of variance. This is assuming one has the skill and knowledge to pilot the top deck. But others feel that to be enjoyable, the game must contain an element of innovation. If they aren't playing a rogue deck then the format is stale for them. The skill they focus on is strategic and long term. They are assuming they know the top decks but prefer other card choices. The upside to this is they probably know the ins and outs of their decks better than anyone else. Surprise tactics and the joy of the hidden threat are the main weapons here. I tend to enjoy creating tier 2 or lower decks for the sheer delight of turning card ideas on their heads. I am not as innovative as some players but I like to think that I am at least somewhat different from the herd. So while I may netdeck something to play in a top tourney I am more likely to come up with my own brew and hope for the best. This is one reason I am not a tournament player. Losing isn't a good incentive to keep competing. There has been discussion lately of how high variance the Standard format has become. I don't know if the same people complaining it is too random are also complaining that it is too stale. I, for one find it neither too random or stale. The fact is deck building is an art form that like any complex art requires a certain amount of practice. It is also a science in that there are mathematics and probabilities involved. If you insist on playing with high cost cards and fewer than average lands expect some very bad draws. The same is true if you play with the usual amount (or more) land and have a lower than average curve. You can expect a lot of flooding and having many extra lands that you wish were effective cards instead. The reason players tend to stick to certain numbers for their decks is to try and eliminate this variance. In a straight-forward "Aggro" build you can expect to draw lots of low cost creatures and spells with a few finishers for later. 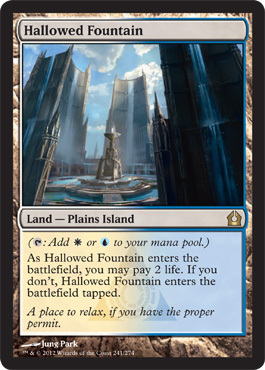 This means your mana base should be lower than the normal 40% conventional land to 60% non-land ratio. 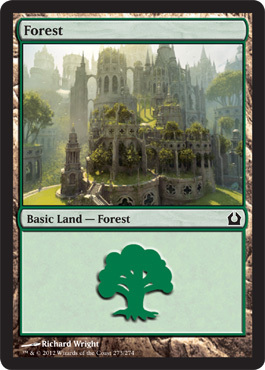 If you are building a mid-ranged control deck you may actually need extra lands and mana producers than normal so that your more expensive spells are castable in a timely fashion. My approach to building decks thus is to add and subtract lands, fetchers, mana sources and draw cards (cantrips too) until the variance is reduced to manageable levels. This isn't always a fun experience, so sometimes it takes me a while before I am happy enough with a deck to move on. I move on anyway if the deck just seems to be fatally flawed. Determining that is difficult, especially when testing against the random opposition to be found in just for fun (JuFF) room. The good is that people do bring original decks sometimes there and there are plenty of competent players even when they don't necessarily have the cards to be truly competitive. The bad is Juff is also home to people who don't feel confident piloting their netdecks in other areas of the game and so you end up seeing a lot more Delver variants than say Praetor's Grasp decks. Not that there is anything wrong with people playing Delver if that's what they find fun. But it can be tiresome to face the top tier decks even when you know your deck can grind it to dust. After all, the advantage in Juff is to the rogue deck player. There will rarely be a second or third game involving sideboards so odd ball, out of the blue strategies have a chance to flourish. And these off beat strategies are important, perhaps vitally so, for the creative spirit of the game which is why I keep plugging away at these articles. I hope to spread the love of different ways of playing the game while demonstrating that it isn't all about unfair saints and swords and insect aberrations. I realize to some extent I am preaching to the choir and yet I may be alienating some of the choir by not sticking to only odd cards. I champion a variety of cards both deemed good and not good. This means you will see some expensive cards in my decks. If you can't afford them do not despair as often you can substitute less effective/efficient versions and get similar results. Also be on the watch for those cards when they are ready to cycle out of standard as they may become easier to obtain. A word about Standard "Post". I loved Druidic Satchel in m12 and was disappointed when Sean's Mckeown's prediction of its imminent success never panned out. I had high hopes for it, just as I have them for Trading Post. I know that Wizards prints cards specifically to cater to a certain class of players and that this multi-use card fits the Johnny script very nicely. 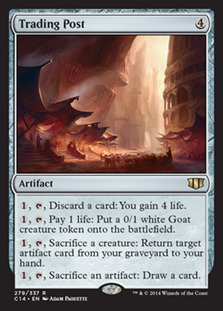 It also almost fits Timmy's point of view of a good card because it does fair and fun things with whole archetypes like creating goats (See Kithkin Goats below) potentially attacking for tons of damage in combination with Coat of Arms or other tribal enablers. Spike might like it in a controlling deck since it has potential to extend the game into turns where control has enough mana to win. The downside is the cost. At three converted mana cost, I am pretty sure it would sit at the top of the non-mythics list for m13. As it is it is probably #7-8 on that list. Will it find a home in a good deck post-September Standard? Well there is no telling all that we will gain in Return To Ravnica yet. But we are losing some cards that really love Trading Post: Solemn Simulacrum, both Wellsprings, Wurmcoil Engine, the swords, and many more. In the meantime some of these decks which use the above cards also run some number of Trading Posts and I expect some form of these decks to survive the cycling of sets into Modern format. The namesake of this deck is expensive and probably not playable in tourney magic at least not without help. On the other, given enough ramp and stall you will see it played often enough in JuFF (JUst For Fun room). If it does stick it probably will slowly take over the game. An impatient or low morale player may just concede to it. Its first two abilities can fire off immediately and the ultimate is only 2 turns away. The ramp I chose for this particular version includes Liliana's Shade, (Liliana of the Dark Realm) and seven artifacts split between Gem of Becoming and Mycosynth Wellspring. Trading post makes the wellsprings more attractive and gives you more stall options until late game. The sole Shimian Specter may put some pressure on their hand. Titans help with the mid to late game and Black Sun's Zenith helps against swarms. Even with just x=1 you can obtain board control until your heavy hitters get going. Thought scour acts as additional draw as well as an annoyance factor against some decks. Since you aren't running any miracles yourself they will almost always be pointed at your opponent's deck, probably right after they attempt to set up the top of their libraries. 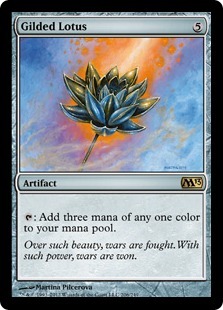 I tossed in a single Gilded Lotus in the process of tuning the mana for the deck. Usually the flood provided by all the fetch and fixing would be annoying but trading post negates this and helps continue the flow of your deck. 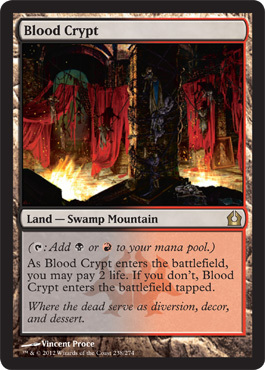 Since we are about to get the Ravnica Dual lands back in two installments I would probably add in Steam Vents and Blood Crypt (assuming they come down a bit in price from their current highs.) Many of the cards are going to cycle so there may be no point in trying to keep the deck together past this point but I am sure there will be cards to replace the titans and wellsprings. 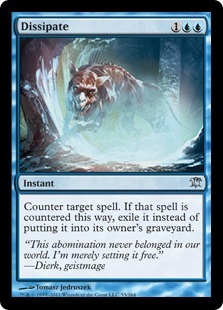 Cruel Ultimatum for example comes to mind as a companion for Nicol Bolas. As does Grixis Charm. Of course you could also toss in a copy of the Legendary Elder Dragon version of the planeswalker. I wouldn't recommend this as the upkeep of is rather brutal but if it does hit your opponent the effect will be equally offensive to them. One of the coolest new cards in m13 is a one drop that does nothing until it gets counters on it. Question: How to make Slumbering Dragon playable? Answer: Add counters by force. So your opponent understandably doesn't attack you because they don't want to be hit by an 8/8 flying dragon? OK Increasing Savagery will teach them to think again. Hunger of the Howlpack is a sneaky pumper and Rancor helps turn your suddenly huge guys into tramplers. Predator Ooze is another great target for hunger and savagery and Travel Preparations. The next deck also features Slumbering Dragon but has a slightly different purpose for it. Oros Control showcases for the last time the power of proliferate and the cards that allow it. No infect here. 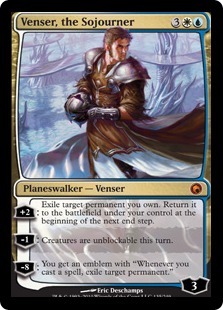 The plan is to stall and slow your opponent with the planeswalkers and removal cards while building up to your own creatures, in particular a Herald of War. If a herald dies, this is all to the good, as your graveyard recursion, in the form of Defy Death, loves to bring them back. After playing with Ajani #3 for a bit I have decided that it just doesn't work in this deck. I almost never have a good target for it right away so it sits and sits in the hand until it is no longer a critical play. So I replaced the two copies with Trading Posts. Other decks in this article rely more on unburial rites which could be used in this one as well but I decided the interaction with Herald favored using Defy Death. Volt Charge and Tezzeret's Gambit are primarily for proliferation but their secondary uses are important to not neglect. Even without any valid counters to add drawing cards may save the game for you and you may find that you have to kill an early aggressor. The interaction between grimoire and flayer allows for some sudden end games. It still amazes me that people don't seem to regard either as a threat. 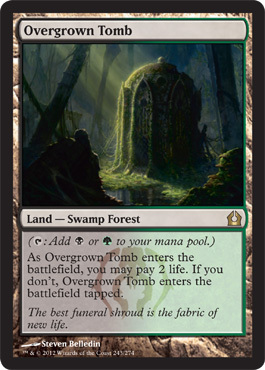 The singleton shrines are more about having a two drop that does something after sitting around than their specific functions. 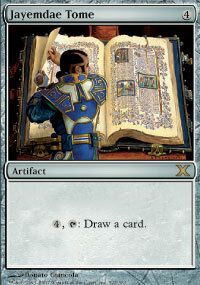 Plus they may mislead the opponent as to the nature of your deck which seems like value enough if it happens. Chandra works as attrition/removal and can be a great boost to either of the proliferate spells. Doubling Volt Charge or Tezzeret's Gambit takes care of the cost while adding great benefit. This is based loosely on the "Solar Flare" archetype, using (Heralds of War) as the central card. With 8 sweepers this deck is fairly well positioned to control the board against aggro decks assuming it survives the first few turns. The inclusion of Hex Parasite is meant to be an answer to the variety of aggro decks that run blood thirsty creatures or other counter gainers as well as for the ubiquitous planeswalkers that abound in midrange and control. To be fair this isn't really a Solar Flare deck since it doesn't run Sun Titan or Phantasmal Image and it runs Defy Death and Grimoire of the Dead which are probably not competitive enough for the best decks. They are however, deceptively good. 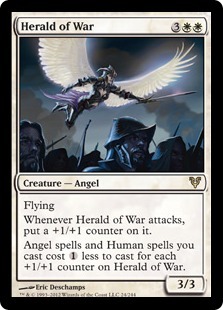 Defy Death into a Herald gives you a 6/6 beater when it attacks which also discounts any angels you may have in your hand by 4 mana. Griselbrand was the biggest adjustment I made to the deck after discussing it with the knowledgeable and helpful Keya Saleh. He and others recommended the Legendary creature, so I added 4 for maximum profit. Who doesn't want to draw 7 cards a turn? I've found reanimating him is usually enough to garner a concession and if not he often tilts the game tremendously to my favor even if he doesn't stick around. As I mentioned in my previous article I was quite thrilled to see Quirion Dryad has been reprinted and set about trying to find decks for her. After a few false starts I came upon this idea of using a loose version of the Frites shell (minus mulch which seems less good here.) The Lingering Souls serve as stallers and also fuel for Talrand's drakes. Talrand himself is one of the key players alongside Quirion in applying the beats since he creates an air force for you. Frost Titan is usually the late game closer. Generally, I like 40% land to non-land ratio but since this deck has a lot of explosive early plays I felt 2 (Sphere of the Sun) instead of two more lands was justified. So much happens turn 3-4 that the spheres really help kick things into gear early on. One of the most well known and beloved archetypes of SOM legal standard is Birthing Pod. Rock Pod is a lesser known version but one of my personal favorites. This one last chance to make a Standard-legal list had me thinking of Massacre Wurm and thus this deck was born. The interactions seem fairly obvious as with most pod decks you try to land a pod and use it to chain up from a low cost creature to higher cost creatures with the additional bonus of some enters the battlefield effect or leaves the battlefield trigger. For instance, Archon of Justice fetches a Wurm and exiles something on the way out. Unburial Rites here helps retrieve sacrifices and those monsters sent to the graveyard by the opposition. Though Elesh is now far more affordable I still see her as a bit too rough for casual play so I left her on the sideline instead choosing her more obscure yet no less brilliant sister, Sheoldred. 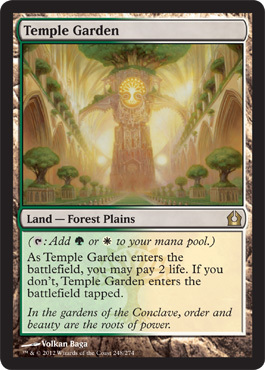 Gem of Becoming is a tricky card in that you don't always need/want to take 3 lands with, though of course thinning your deck is usually good. All in all though I may just replace them with more Vessels and a Lotus. This deck really wants to be able to cast a 3-4 card Diabolic Revelation to set up the combo so the land thinning is less important than acceleration. 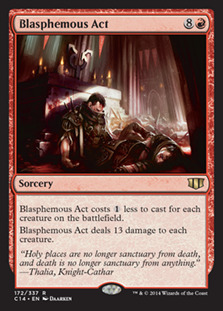 I'm pretty sure I've talked about this combo before: Blasphemous Act and Stuffy Doll = 13 to the dome + wipe the board. The fun thing about this is that this deck doesn't really care about being swept so the act tends to be one sided. I also added in a Kuldotha Forgemaster to help get out Blightsteel Colossus or Spine Of Ish Sah as needed. (I used this to great effect one game to to break out of a prison involving Stormtide Leviathan and other similar cards.) Kuldotha Rebirth + Spine of Ish Sah + Trading Post is pretty much cool too. 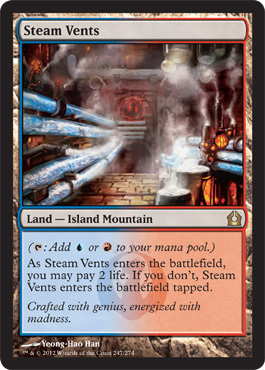 The low land count in this deck is offset by the numerous wellsprings and ways to sac them and other mana producers (Talisman and Satchel). Tome might seem a bit too weak compared to some of my other draw cards but it is a classic and pays for itself very quickly. The draw can be a little scary but the deck is really a blast when it works. Also sometimes known as Black Ramp as my mood changes, this deck fairly quickly gets to enough mana to cast massacre wurm despite the cost and relatively low land count. If I were to change anything in it I would add in some tutors and maybe an Exsanguinate, perhaps replacing some of the numerous removal spells. This started as a thought that Liliana #3 couldn't possibly be bad if you can keep it out a few turns. So far I have had some fun games with her with mixed results. Her #2 ability does protect her but only partially. 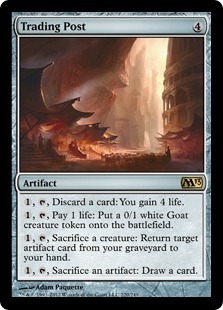 As the name implies this deck uses Trading Post to great effect recurring various artifacts, sometimes creating goats to sacrifice and as a sacrifice outlet. This last deck is pretty easy to port to new standard and will probably get some nice additions once RTR has come out. With all the possible decks in the format at the moment this one hasn't shined too much but it does fairly well against all but the top tier. Though no "Señor Stompy", it still manages a fairly quick beating while living long enough to get out the fiercer late drops. I suspect this deck might be popular with newer players looking for a relatively cheap build. While it has a few expensive cards in it, nothing is terribly over the top. 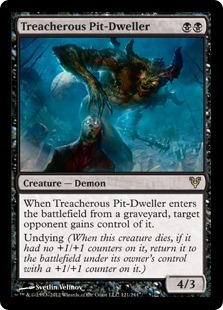 I don't usually worry about budget when building, trading cards in and out of my collection as needed for staples or cards needed in certain decks but for those who do think about this, the Garruks and single Primeval Titan are the expensive cards and if you can't afford them you might want to substitute the cheaper Primordial Hydra or (Ulvanwald Tracker) which are both reasonable if not great substitutions. While I missed the 1st annual Modern format birthday celebrations organized by the indefatigueable BlippyTheSlug I have maintained a watchful eye on the format as I continue to brew decks for it. One archetype that caught my eye was Death Cloud Rock and I have been experimenting with variations on this since I saw it in one of the many Overdriven! articles Blippy posts regularly. Nothing terribly surprising here. Death Cloud is attrition as are a lot of these other cards even though they may not seem like it at first glance. 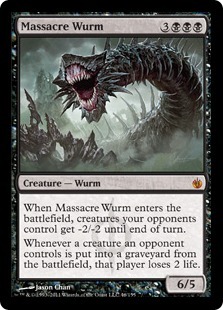 The deck essentially stops and slows the advance of the opposition's plans while building up for a large drain in the form of Massacre Wurm. Even against creatureless decks, Forbidden Orchard tokens in tandem with Blood Artist and Wurm can be enough for a kill. I took the Massacre Wurm/Blood Artist shell, inserted Faithless Looting/Unburial Rites and added in the Lark combo which consists of Reveillark, Mirror Entity, Body Double. 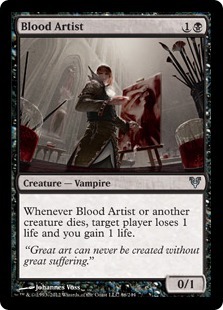 Get a Lark in the graveyard with Blood Artist there already, and Mirror Entity on board then cast Body Double copying Reveillark. Activate Mirror Entity 100 times with 0 as the cost, then start resolving the triggers with Body Double bringing itself back as a copy of Lark and also Blood Artist. This should kill your opponent and then some. Mulldrifter and Disciple of Bolas round out the deck with card drawing. As much as I hate sitting around waiting for a combo player to go off, some combos are very attractive to me and for some reason this version of Lark really hits the spot. Yeah yeah no one likes to be on the other end of a counter deck but in this format with killer combos and aggro lists starring Tarmogoyf, denial is not something to sneeze at either. Thus I started thinking about how to build such a deck with fun and interesting plays. The creatures all have "Enters The Battlefield" triggers which are exploitable with Undying Evil, Momentary Blink and Restoration Angel. In addition some are fetchable via Mystical Teachings which means all this happens at instant speed. Torpor Orb throws a damper on this plan so sideboarding probably includes some form of artifact hate and or bounce if you end up in matches with the deck. No, not storm as in make 1,000 goblins and charge! Or draw your entire deck and then drain for a billion. Storm as in Ion Storm. An obscure rare that does fun things with counters. And by fun I mean dealing damage to creatures and players and incidentally resetting undying for creatures that are dying. We even get to use the relatively unplayable pit-fiend because of the following interaction: He dies, comes back and the trigger to give him to target opponent goes on the stack so you pull a counter off of him to shoot him and then shoot him again once the trigger resolves to get him back with a counter on him. Thanks to AJ_Impy for pointing this out to me. You can also just sac it to your sac outlet if it dies without an Ion Storm on board. Meanwhile if you have Flayer of the Hatebound out, the damage really adds up. Later on Cruel Ultimatum should seal the deal. All in all this is a fun deck if a little tough to get going vs some of the more focused decks. The main problem is that while many of these cards are good on their own, the combo with Ion Storm is really key to good functionality. Trading Post helps this a little by giving some added draw to the deck early on. As I mention above I have lots of good feelings toward Trading Post and one of the reasons for that is it makes 0/1 white Goat tokens. And in one of my many fruitful conversations with AJ_Impy I was inspired to create a deck list featuring this aspect of the card. Leyline of the Meek is a card I never thought to include in any deck but here it is. And its purpose is so straightforward as part of the tokens focus that I think it explains its own presence. The deck seeks to land some tokens with pumpers in the form of Leyline, Honor and Intangible Virtue and beat down with multiple goats that are huge. I could have included the goat producing land, Springjack Pasture, but decided it interfered with Emeria and so cut it. This deck is purely for fun and I wouldn't recommend running this in a tourney setting but it should do well against even moderately strong decks. The pure joy of beating someone down with Goats is enough to justify this decks existence even without running the usual suspects of Wrath of God, Path to Exile and Swords to Plowshares. The timer was ticking and Kuma called time just as I was about to register the deck with Vantar's new Google Docs form. Since there were 15 people registered already _Kumagoro_ let me play in his stead. Thanks again Kuma. I like these offbeat formats and while this isn't the exact tribalton format I came up a while back it still was lots of fun. First round I played against the infamous DirtyDuck who always runs top decks and typically mows down his opposition regardless of their own efforts. However the filthy feathered one ran "afowl" of my single Venser both games and with plenty of swords to nullify his removal suite my Angels wreaked havoc over his artificers through the air. "Suckers, beware! My blood is sacre-...ahhhhhhh!" My plan was simply to field strong flyers, get a sword and stick it on them and be invincible that way. Seemed to work except in round 2 vs Vampires where excessive drains and bad draws on my part (Flood game 1, famine game 2) said "Not today!" Round 3, I ran into my friend Nagarjuna also running Vampires and took revenge on the blood suckers in 3 games. (I am not sure of the exact sequence of events but I'm pretty sure Naga just didn't draw very well.) So I ended up winning 2-1 in the money (1.6 credits from Traders) and got the topical tribal prize as well from Clan Leys. As you may or may not be aware, the Wide Beta of the new client is now in session as of September 5th. If you have not had a chance to check it out in July's Sneak Peak I strong recommend you do so now. This is the direction that WOTC has chosen and it is vital for us to help them steer the new client in a direction we will find both usable and enjoyable. To avoid the debacle that happened in 2007 I hope we can give them enough sound advice that they take to heart, so the new client ends up eclipsing version 3 and leaving it in the dust of history. This article took much longer to write than I anticipated and I lost sections early on due to my own stupidity that would have sped things up by a week so my plan to provide more timely content has gone seriously awry. My apologies for that. On the other hand because of the delay I was able to add in content I wouldn't have otherwise had yet. Also this week was fairly tough for me on a personal note. A recently reunited friend of mine died a few weeks ago and this Wednesday was the wake. He, like myself struggled with sobriety, some social issues and was generally a larger than life fellow. His life was getting in order and things were shaping up for him and so it really shook me to have to deal with this now. If you do nothing else with the game, enjoy it. Do not take away all the losses, insults, injuries to ego, failures and disappointments. Take away the fun and joy and use it to make your life and those around you happier. Paul Emerson Leicht aka Winter.Wolf. Hey love the article and your decks for modern are awesome and I hope one day I can make decks like that. Dead Rock seems to be my favorate I love Midrange decks they play what people think are bad cards but they work really well. Hey MCM thanks, I too, really enjoy midrange decks. People assume you are doing one thing and you do something else and they sometimes get caught between the zig and the swerve. Just won a Standard PRE with Trading Post.dek (WRG version, G only for Thragtusk). I stand corrected from my opinions on the Post back when I wrote my evaluation article about M13. I thought it was a cute card and a great design, but I was somehow skeptical about its competitive applications. It's powerful instead, flexible, easy to use, never dead, it's something the opponent in game 2 will learn to deal with at sight. It's the kind of card you have to try and play to fully grasp. 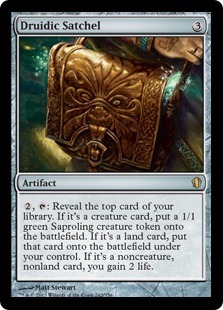 It's more in the same league as Birthing Pod (insane card advantage and deck-seizing centerpiece) than Druidic Satchel. I don't get the part where you say, "The downside is the cost. At three converted mana cost, I am pretty sure it would sit at the top of the non-mythics list for m13." Are you still talking about the Post here? Because it's not 3 CMC, and it's pretty cheap right now (at least, 0.74 for a highly playable rare that defines an archetype sounds cheap to me. I actually suggest everyone interested to buy a playset asap; it's true that SOM block rotating out will harm it, but we don't know what will happen during RTR block, and it will live up until M14 for some months as well. Things might suddenly go crazy). I thought the two sentences gave context to the type of cost I meant. 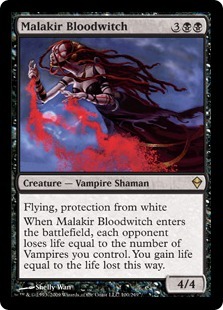 (Converted Mana cost of 4.) I think it is slightly overcosted to be a top card. It is certainly still great and will see play as you said but if it was 3cmc people might compare it to cards like Cursed Scroll. As a nonmythic 3 cost would be the sweet spot. I am thinking the R&D dev team realized this and deliberately notched it down a peg to keep it from being in anyway broken. .74 seems insanely cheap but that's drafting for you. Everything drops. Congrats on your win. I'm curious about your deck. I agree it's perfectly balanced, to the point people like me never even recognized its competitive potentials at first. What do you think of the upcoming Gorgon planeswalker? Because my thoughts are just "WANNA WANNA WANNA WANNA! ", but I'm in a big Golgari phase right now and RTR will just make it worse. In this case too, I can't really say if she will see big competitive play, and it's again a matter of CMC. The Ion Storm deck in particular looks like a lot of fun. I had not given any thought to combining it with Undying. 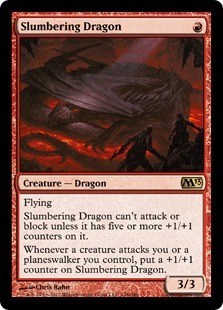 With enough cards that add Counters, slumbering Dragon does look like it could make for a Comboish deck, similar to Infect. I think there could be a version with possibly adding Apostles Blessing to protect it, and fling for a quicker kill. Hey put together a list and try it out. Sounds nasty. I love your philosophy on playable decks and it is one that I share. If it isn't fun, I don't play it. If it doesn't catch my opponent off guard - I don't play it. True, most of those decks wont win any tournaments, but like you said "Losing isn't a good incentive to keep competing" and I totally agree. Great article! I love the rich amount of content in each of your articles. The decks also look pretty fun! Wow you got a lot in here! Is there any way you can add more deck lists next time though? All joking aside, good stuff. Abd you know how much I like the drawings.